How will moderators appear to the community? What will our moderators say and how will they sound? How will we keep the community as safe as possible? When do we want to moderate? What will happen out of hours? How and when will moderators and the community communicate? Every online community I have been involved in has been set up differently. They have each given their moderators (and sometimes peer supporters/advisors) slightly different roles and responsibilities. Sometimes this was a conscious decision, sometimes an evolution. Sometimes I think it was because those involved had only ever considered one option. In this section of the training we explored the benefits and risks of moderation by different groups. We also considered the role of all community members in moderation and whether different types of moderation might be more or less appropriate for different groups to undertake. I’ve written more about this here. No magical moderators here – this section explored the different names or personas that you might ask your moderators to use – and why. These included individual moderator names (e.g ClareF), a single persona or character (e.g The Ele) and/or a single moderator name under which everyone works (e.g. Jo@Samaritans). A biggie. This discussion was all about what moderation will look like within the community. It’s definitely one that you’d want to try and answer with as much community input as possible. When and how will moderators step in? When they do step in, what will they say and how will they sound? Will they start discussions and share content? What support will they offer people in crisis? I also outlined some suggestions for basic moderator training – and some suggestions for creating useful moderator guidelines. Another biggie – and often one that often becomes a focus for concern. It’s all too common for conversations about online support to jump straight to risk – and stay there. In this session we did discuss risks and worries – but also good practice, privacy, confidentiality and safeguarding, mitigating risk and establishing the right balance for your community. As part of those conversations about safety and risk we discussed options for moderation hours and how moderation might be structured to balance appropriate moderation cover with concerns over capacity and cost. What might happen during those times when a community is not moderated? In a pre moderated community, not much. Some communities even choose to close when there’s no moderator around. In a post-moderated community, interactions and support will continue. What can you do to help ensure these are as safe as possible? There are lots of different times when moderators and the community will want to communicate – and lots of different ways they might do it. when site admins/moderators want to communicate with everyone at once. 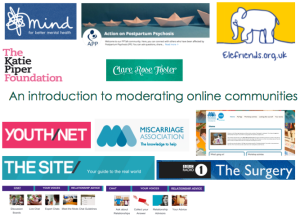 For each of these situations we discussed what might need to be communicated (for example guidelines, introductions, guidance, feedback, signposting) and different channels for communication (for example videos, email, private message, a public post). Throughout the session I made sure people had chance to chat about their own community and start making some initial decisions. At the end of the day everyone came together to share and workshop some of their ideas for next steps. “Thank you for an engaging and informative workshop. The content was exactly what we had hoped for and was delivered in an interactive way that meant I was able to get the answers to questions that have been challenging me for the last 6 months. 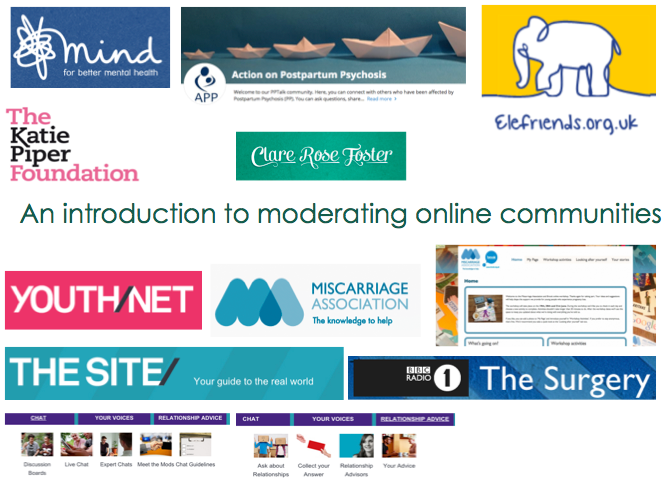 I left the workshop with lots of answers, and clear way forward in developing moderation for our online peer support community. I also now know where to go to get the answers to any further questions that I have.